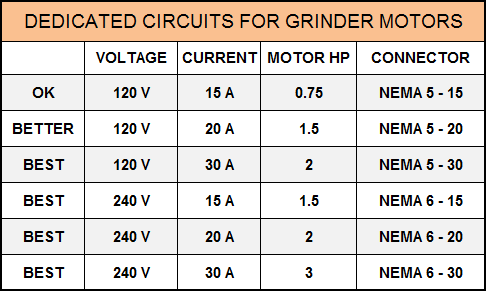 I get a lot of questions on the blog about what motors work for grinders. The truth is, many motors will work, but some are better than others. Then there are the motors that have their challenges. Armed with a little information, you can decide if a motor will suit your belt grinder application. The first thing we look at when understanding motors is the different parts and what they are. The figure below shows a motor and the important parts. Although all these parts are important, there is nothing more important to us than the nameplate. When it comes to figuring out a motor, the most of the important stuff is found on the motor's nameplate. The nameplate is the label or metal plate that gives the manufacturer's name, model number, voltage, current, speed and horsepower as well as other details that will be useful in deciding whether a motor will work for your belt grinder. The nameplate has a lot of info on it. Let's digest some of the important pieces. I will draw a red rectangle on the parameter so you can see what it might look like on your motor. The first and foremost thing to look at when it comes to AC induction motors is phase number. If your motor is a single phase, PH 1 or similar, you have to use single phase (household) voltage to run the motor. This also means that controlling the speed of the motor is pretty much out of the question. That doesn't imply the motor is useless, only that the grinder's belt speed will be fixed unless you add counter-shaft with sheave and a belt to adjust the belt speed. If the phases parameter is 3 or PH 3, then you will need three phase (industrial) voltage supply, a VFD or a phase converter to run the motor. We'll discuss that later. In our example we have a single phase motor, so let us continue down that path. Motor manufacturers put the voltage (V, VOLTS, U etc.) ratings on the nameplate so you know what supply to connect it to. Motor manufacturers tend to use 115 scale, that is 115/230/460 volts. Just remember that for our purposes 110, 115 and 120 are all the same thing; and that 220, 230 and 240 are all mean the same thing. It's like low and high, but wait! What if the motor is 230/460? Well, high is still the higher of the two voltages. Nomenclature Note: I use 120 V or 240 V when describing supply voltage. Why? I use these numbers as they are based on 12/24/48/120/240/480/600 and 208 (square root 3 times 120). This is recognized as standard for supply. However...some people (like my Dad) still use 110 V. Others use 115 V and that's fine. What's important to remember is that 120 means the same things 110 or 115. The National Electrical Manufacturer's Association (NEMA) suggests that a motor's voltage range is plus or minus 10 % of the nameplate voltage. 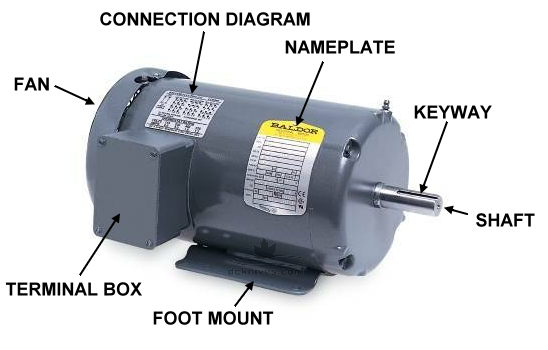 Therefore, a motor's nameplate that states 115 volts can be supplied a voltage between: 104 V and 126 V. A 230 V motor can be supplied with a voltage between: 207 V and 253 V. You can see the voltage supply numbers are pretty loose when taken within the 10% plus or minus range. Dual voltage: When a motor voltage rating has a slash in in, this means the motor can be configured to run at different voltages, quite often 115/230 V. NOTE: The motor does not automatically know what voltage it will be operating at. You must change the wiring in the terminal box to change voltage the motor is to run at. Be careful when looking at a motor's voltage ratings. Some motors will not work conveniently with your available supply. As a rule, single phase motors are either one voltage 115 V. or dual voltage 115/230 V.
Three phase motors may come in a variety of voltages such as 208 V, 230 V, 460 V or 575 V in North America and 220 V or 380 V in Europe/Asia. If you are wanting to run a three phase motor with a VFD, check that the nameplate on the motor states 230/460 V. This is common for NEMA motors. 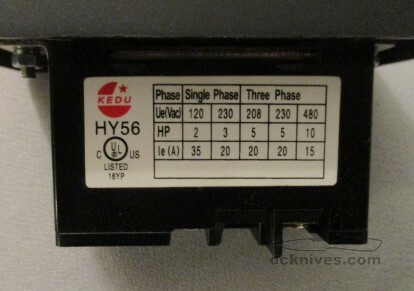 However, some motors are 575 V only! A 575 V three phase motor would require a VFD that is not easy to run from home without special equipment. The Amps number is the current needed to run the motor. It's stated in Amperes (A, amps, Amperes, I, FLA, Full Load Amperes, etc.) 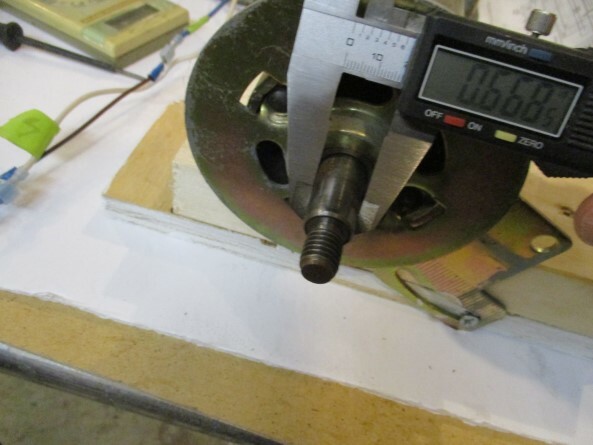 The current on a motor nameplate is very important as it lets us calculate what gauge (thickness) of wire to use as well as what amperage of circuit breaker is needed to operate the motor. Motors are dynamic loads; that is they don't draw the same amount of current all the time. When a motor starts it can draw up to five times the normal running current. This is why the lights seem to blink when the old fridge compressor motor kicks in. The nameplate current is the running amps of the motor at the rated horsepower. Dual current? If there is a slash in the current rating like 7.6/15.2 it means the current ratings are for two different voltages, in this example 230/115. Yup, when the volts goes up the amps come down. The power of an induction motor is expressed as horsepower (hp) or kilowatts (kW). Horsepower is the commonly used unit in North America, whereas the rest of the world uses the International System of Units' (SI) kilowatts unit. 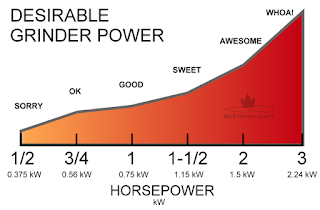 One horsepower equals 0.746 kilowatts if you need to do the conversion. Induction motors are made from fractional horsepower ratings like 1/3 hp to thousands of horsepower. For a decent 2" x 72" belt grinder, we're looking for ideally 1 to 3 horsepower, with a preference for 1.5 to 3 horsepower. The motor needs to have enough power to perform efficient knife grinding and general metal shaping tasks. A technical publication I read a few years ago from the German abrasives manufacturer Klingspor recommends 1 hp to 5 hp per inch of belt width. As we are working with 2 inch wide belts, this range is 2 hp to 10 hp! Luckily, empirical evidence suggests that 2" x 72" belt grinders are quite useful, (although a little under-powered) at 1 hp; extremely capable at 1.5 hp and awesome at 2 or 3 hp! The speed of an induction motor is based on the number of poles (or windings) the manufacturer builds into it. The more poles the motor has the slower it will spin at a given frequency. Two pole motors are fast, whereas four pole motors are half that speed. In North America, you will see motor nameplate speeds that are approximately 1725 RPM or 3450 RPM at rated load. On occasion we find even slower six pole motors which will spin just under 1200 RPM and eight pole motors that spin around 900 RPM. The six and eight pole motors are not very useful for a direct drive belt grinder as they run too slowly and would require very large drive wheels to keep the belt speed in an acceptable range. 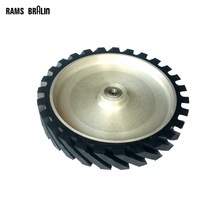 They may be be better suited to other applications like honing, sharpening or polishing where slower speeds are advantageous in reducing heat from friction. The synchronous speed of a motor is often stated by the manufacturer. Example 1800 RPM or 3600 RPM. This is a consistent way of describing motor speed without factoring loading or slip. 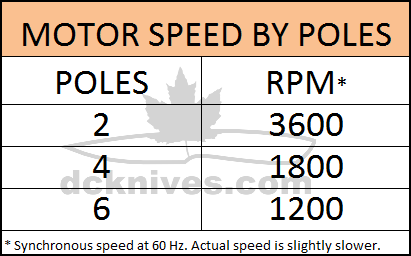 Here are the synchronous speeds at 60 Hz for common induction motors. For 50 Hz supply, the table above would read 3000, 1500 and 1000 RPM. Don't worry if your motor nameplate shows something a little bit less than 3600 or something less than 1800. Nameplates show the RPM when the motor is under loaded conditions. Every induction motor needs to slip, that is, be "out of sync" with the supply voltage. When a motor spins freely without load, the slip is small. As you increase the pressure on the belt, the motor slows and the slip increases. only under load will the RPM will be 3450 or 1740. There are some less common single phase motors that are both two and four pole motors in one frame. These motors can run near 3600 or 1800 RPM and are usually found in hot tub water pumps.If you can overcome the pump shaft problem, you could easily have a single phase low/high speed grinder at the flip of a switch. The RPM of a motor has a big influence on how fast the belt will be moving. For a direct drive setup, meaning the drive wheel it attached to the motor shaft, this is very important. 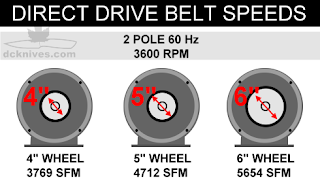 The diagrams below show direct drive wheels of three different sizes, 4" (100 mm), 5" (125 mm) and 6" (150 mm) and their respective belts speeds in Surface Feet per Minute when being driven by a four pole motor at 60 Hz. And the same drive wheel options being driven by a two pole motor at 60 Hz. The Service Factor sometimes labelled as SF is a multiplier which indicates how much a motor can go over its rated current for a short period of time. For example, a Service Factor of 1.4 would mean the motor can temporarily operate at 140% of its current rating. This is not meant to be continuous, rather the SF is helpful for calculating the current to bring a load like a flywheel or conveyor system up to speed as it may require larger service, cables, switches and so on. In the case of our nameplate, the SF A (Service Factor Amperes) is stated as 7.6 / 15.2, which means this motor can pull 7.6 A @ 230 V or 15.2 @ 115 V for short periods. SF is not a big concern with belt grinders as grinders are usually started under light loads and quickly get up to speed. The time or duty parameter on a nameplate indicates whether the motor was meant to run continuously or intermittently. Some motors are designed to run all the time, while other special purpose motors are designed to have rest periods where the motor can cool. Continuous Run motors have a code of S1 or CONT. Motors that are not meant to run all the time will have codes like S2 or specify running time in minutes like 30 or 60. Ideally you want a motor that can continuously run without overheating issues. The temperature rating of a motor will either be labelled temp or ambient and is usually stated in degrees Celsius. Temperature is not normally an issue for garage or workshop applications. Avoid putting your motor in an enclosed area where heat can build up. If you live in a crazy hot place, you may have to derate the motor. An example of derating would be a 2 hp 40°C motor should treated like a 1.5 hp at 50°C ambient. Keep your motor in free moving air to avoid heat build up. When operating the motors at slower than intended speeds this become a larger problem. See more in the Hertz section below. Wiring inside the motor is insulated and can withstand some pretty warm temperatures. The higher the temperature of the insulation, the better the wiring will hold up when overloaded. Class A is okay at just above boiling, but Class H is 75°C (167°F) better than Class A. Again, for the most part, insulation is not really a concern in belt grinder applications unless you're loading the motor heavily for some period of time and generating enough heat to exceed the insulation class. 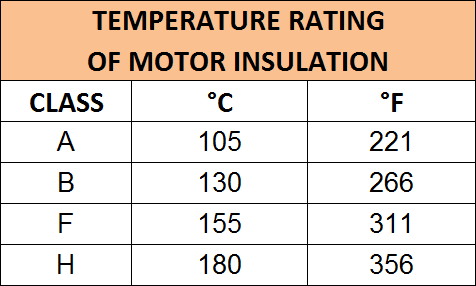 This is a table of the insulation classes A through H and their °C and °F temperature ratings. The Hertz rating tells us what supply frequency the manufacturer designed the motor for. This is usually 60 Hz for North America and 50 Hz for Europe/Asia. 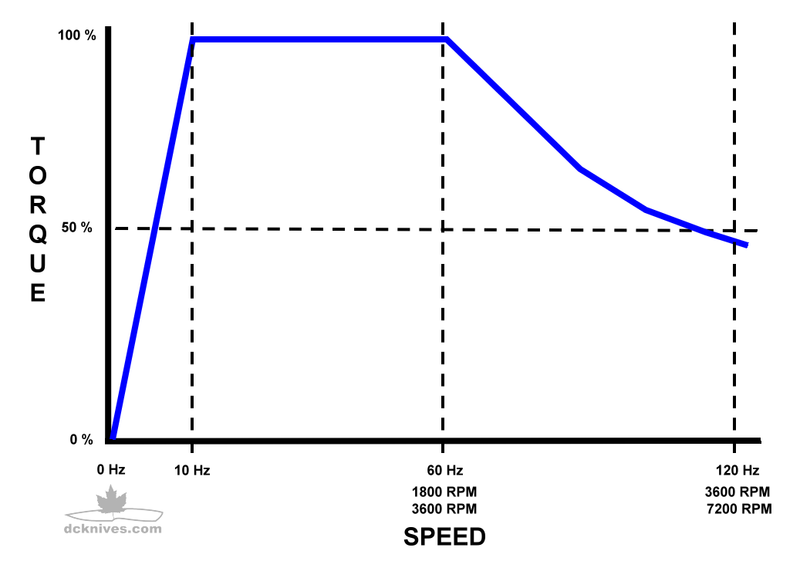 Hertz or frequency rating is directly related to the RPM rating or speed; that is, the same motor will run faster when fed with 60 Hz than 50 Hz. The difference in speed from North America to Europe is 50 divided by 60 or 5/6 or 0.833. Synchronous speeds on 50 Hz motors will be just under 3000 RPM and 1500 RPM. Note: This can make a difference in the drive wheel or sheave configuration you choose. The Hertz rating becomes more important for cooling the motor too. 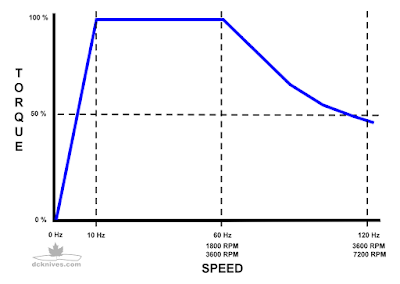 Running motors slower that their rated frequency obviously results in the motor's fan running slower. This impacts overall cooling and could cause overheating in the motor. Slowing down a fan a little can cause a large drop in airflow. See Affinity Laws. The frame code tells us about the physical properties of the motor including the size, mounting hole dimensions and shaft diameter. The frame code does not convey any information about horsepower, however, as a general rule, the larger the frame number the more powerful a motor can be. A 56 frame motor will have foot mount holes at 3" x 4-7/8" and 5/8" (0.625") diameter shaft. A 143T frame motor is larger than a 56 frame and has foot mounting holes at 4" x 5-1/2" and a 7/8" diameter shaft. A 145T frame motor is larger than a 143T frame and has foot mount holes at 5" x 5-1/2" and a 7/8" diameter shaft. There are some special flavors out there like the 56J which has a 5/8" shaft, but it's threaded at the end with a 7/16" NF. These are used for attachment of pump impellers. What you are looking for is a 56, 143T or 145T frame motor as these are well suited for a belt grinder. Some motors are sealed from dust and moisture, while others are not. 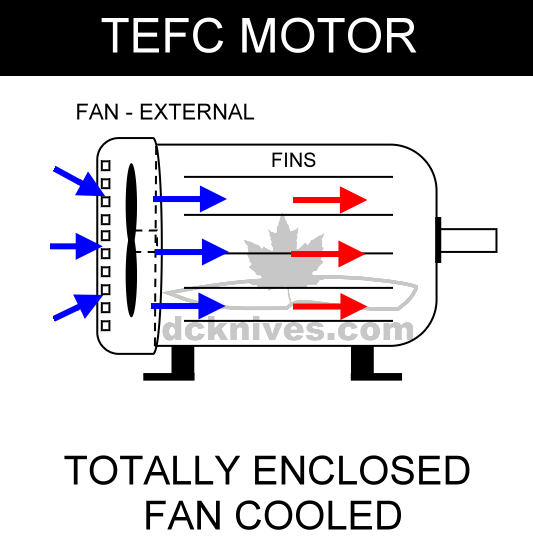 The sealed ones are called "Totally Enclosed Fan Cooled" motors or TEFC for short. In an environment where metallic dust is floating around, TEFC motor is the best choice. With the TEFC motor the fan is outside of the sealed motor and blows air over the motor body to keep the motor cool. A guard of perforated cover protects the fan and prevents someone from sticking there hand into it. TEFC motors are more expensive that their open counterparts because they require more mass, in some cases external fins etc. to keep the motor cool. There are some other variations on the sealed motor with slightly different acronyms. There are Totally Enclosed Naturally Ventilated (TENV) motors that do not have external fans. TENV motors are usually lower horsepower where heat isn't a significant factor. Unsealed motors are typically labeled as "Open" or "Open Drip Proof". 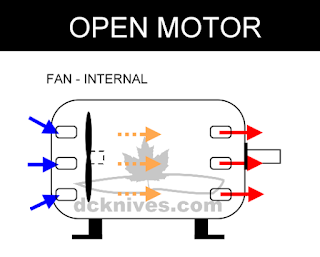 Open, Drip Proof or ODP motors are cooled by an internal fan drawing air inside of the motor housing and expelling the air along with the heat. Unfortunately, open motors also allow dust and moisture inside the motor, so they are not the best choice for belt grinders. Metallic dust being sucked into the electrical workings of a motor is a bad thing. Anecdotal evidence suggests that some protection such as dust shroud and periodic maintenance like blowing the motor out with compressed air works to prolong the life of open motors in what is a pretty harsh environment. Remember that you have powerful electromagnets at work and steel dust will find it's way to the magnetics eventually. On some ODP nameplates it may say "Drip proof in vertical position only," which means the motor was meant to be used in the vertical position like in a drill press where dripping water is not going to be a problem with the electrical parts of the motor. 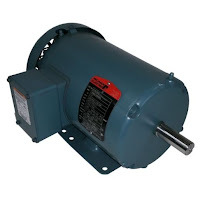 An inverter rated motor has be designed to work with an inverter or VFD. VFDs do not create perfect voltages. The output of a VFD contains noise spikes that can cause damage or puncture to the insulation inside the motor. These problems are more pronounced with long cables going to the motor. 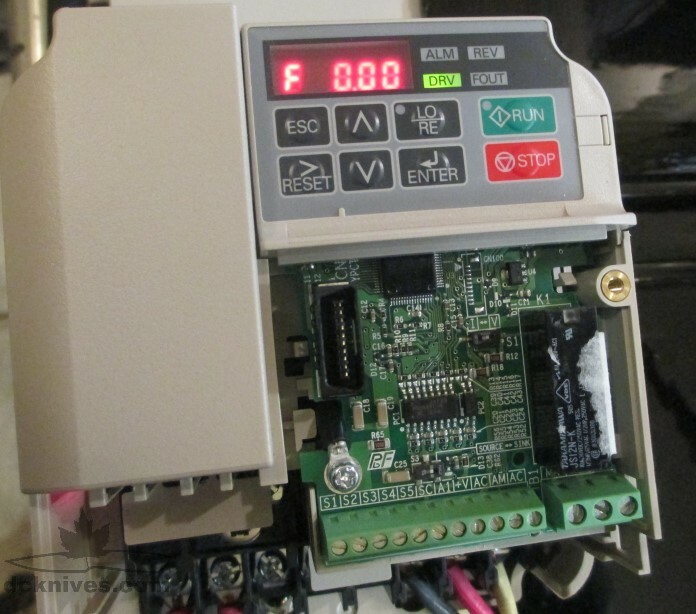 It is always best to have an inverter rated motor for use with a VFD, but is it necessary? For most of us...no. Typical three phase motors have insulation rated for 460 V and we normally operate these motors with a VFD at 230 V and we use short motor cables. Motors are made with a few different shaft configurations and are defined by NEMA standards. Smaller frame motors will use a 3/8" shaft with a flat spot for the setscrew to sit. Frame 56 motors have a 5/8" diameter shaft which can be keyed (or threaded in the case of a 56J). Larger frame 143T and 145T have 7/8" keyed shafts. 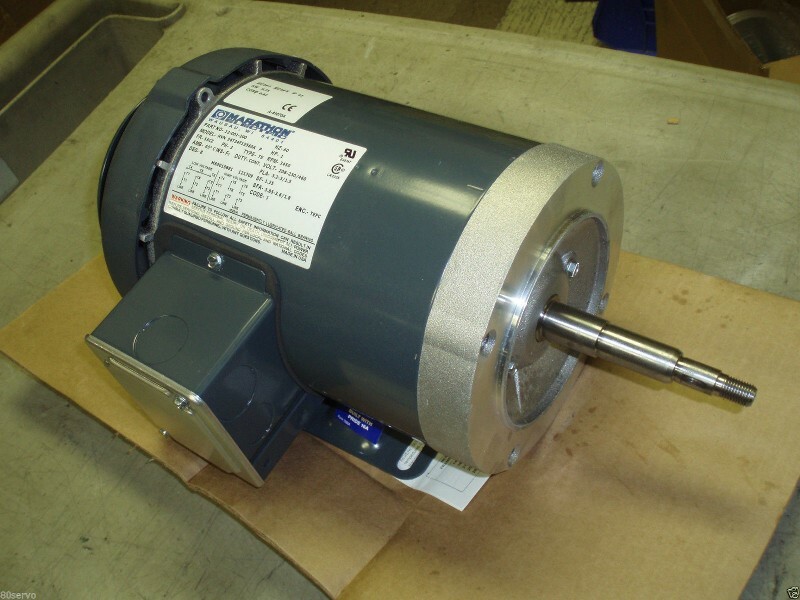 Even larger 180 series motors can come with a 1-1/8" shaft. 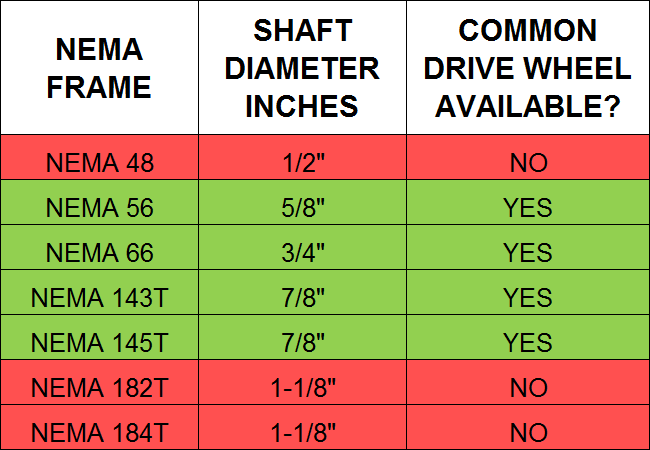 Be sure to look up the frame and shaft size in the NEMA dimensions table. 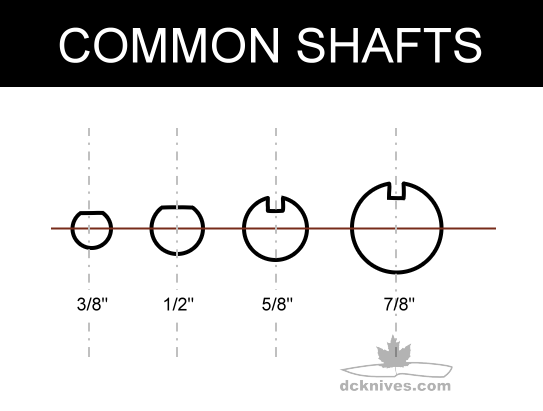 The most common motors you'll encounter will have shafts as shown in the graphic below. Grinder wheel makers typically offer three or four bore sizes in their drive wheels. A survey of sellers on eBay suggests that these are the commonly available bores for drive wheels. 5/8", 3/4", 7/8" and some offer 24 mm for IEC motors. If you plan on using a direct drive wheel and not a pulley/belt/shaft transmission system you will want a motor who's shaft is compatible with the commonly available drive wheels. Refer to the table below. See the NEMA motor table for dimension 'U'. The length of the shaft is important for belt grinder applications. Shaft lengths of 2" or more are preferred as we will need to mount in a 2" wide drive wheel. 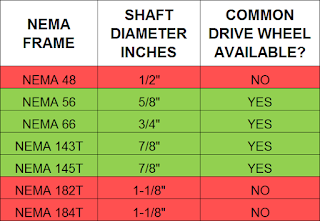 NEMA 56, 143T and 145T have shafts that "stick out" more than 2 inches. Motors with shafts less than 2" can still be used with suitable extensions. As a rule, more powerful motors will have larger shaft diameters. The NEMA standard for motors define this. The smaller 3/8" and 1/2" shafts are for fractional horsepower applications while 5/8", 7/8" and 1-1/8" can be found on larger frame motors. A way is required to secure the wheel to the motor shaft. On smaller motors the shaft can be D shaped and a setscrew on the wheel or sheave will contact the flat spot and keep the wheel secure. Larger frame motors will typically have a slot called a keyway. Both 5/8" and 7/8" keyed shafts use the 3/16" key stock. 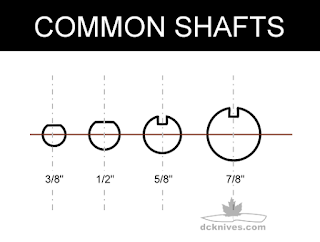 Smaller 1/2" shafts generally have a flat on the shaft for a setscrew. A sheave/pulley will have a slotted keyway just like the motor shaft. 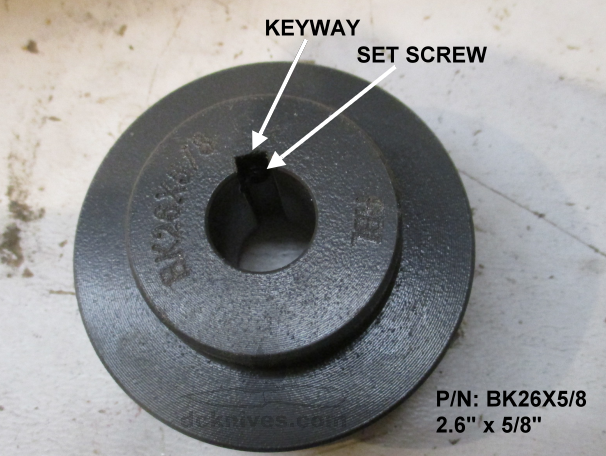 Keyways in the shaft and wheel or sheave are mechanically locked with a piece of square steel, yep called a key. Brilliant! Most hardware stores sell keystock. Many motors do not have easy to use shafts. Motors for specific applications such as pumps have no provision for setscrews or keys. Rather, a threaded shaft end is to be used to fasten an impeller or other type of wheel. This photo is showing an open motor with a shaft intended for a screw on flywheel. A reader (thank you Dan Hargrove) sent me this photo of his nice little 1 hp Marathon 56 frame TEFC. But...what the heck kind of shaft is that? These purpose-built shafts are going to require some adaptation; possibly shims, or possibly grinding and broaching keyways yourself. Read: A lot of work, but if you are getting this oddball motor for cheap it may be worth your time. I'd like to hear your stories of odd motor shafts and how you made it work. Motors are usually mounted with bolts through a mounting foot or through the face (where the shaft comes out) of the motor. With some motors, both foot and face mounting is possible. Face mounted motors are called "C Face". Typically there are four threaded bolting points around the face. 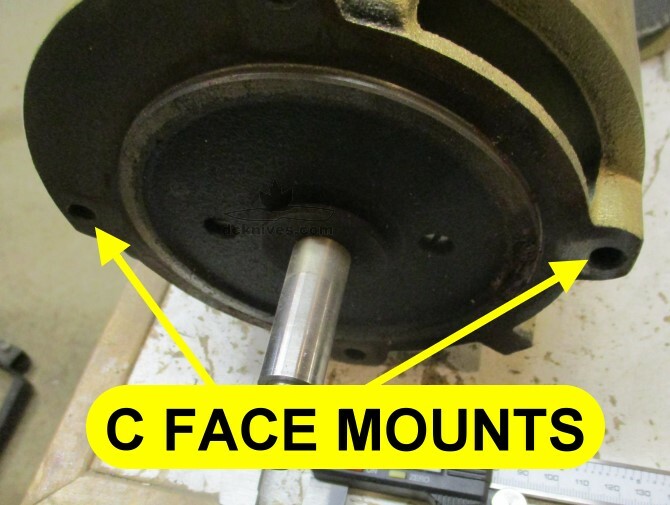 The benefit of C face mounting is that the motor is fixed to the grinder frame and alignment issues can be minimized. 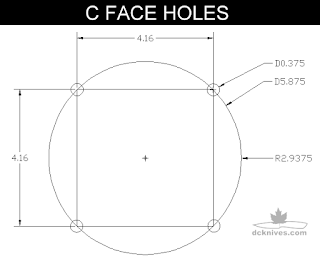 For NEMA frames 56, 143T and 145T the holes for face mounting are 5.875" diameter or 2.94" radius as measured from the center of the shaft. 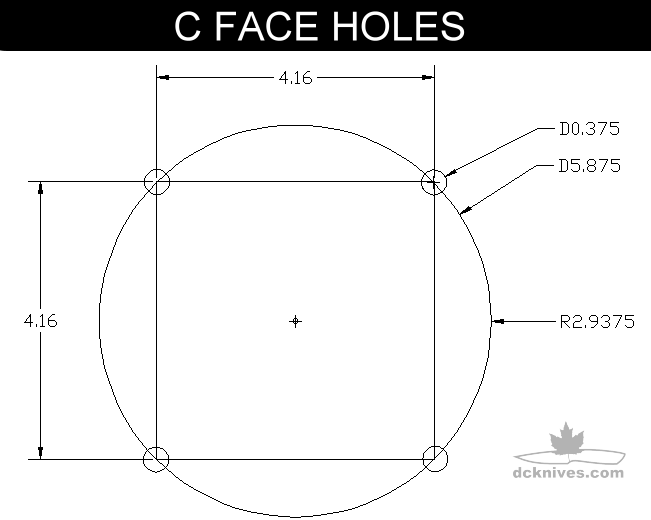 I put this into AutoCAD and made a graphic below showing the center-to-center dimensions which may work better for some people designing a frame to hold a C face motor. Bolts for NEMA C face mounting are typically 3/8" NC x 0.75". Of course, always check your motor mounting configuration before buying any fasteners. Foot mounting is where the a plate or cast frame under the motor has holes for mounting. 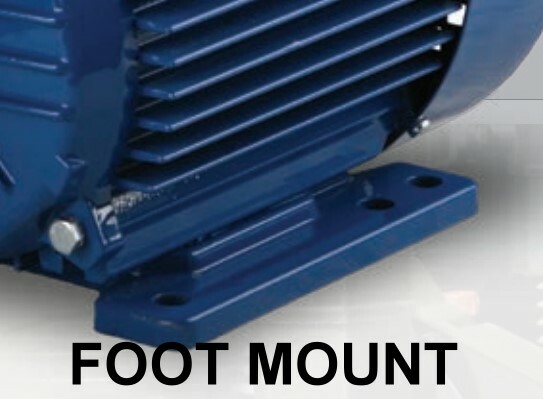 by bolting the foot of the motor to a surface. The foot is supposed to bolted to a steel plate where the grinder fame is squarely attached to, but this can also be a work bench or slab of thick plywood. The motor will be able to cant slightly in the foot mounts, so care has to be taken to ensure the motor shaft is perpendicular (90°) to the belt path in two dimensions. Single phase motors do not have a rotating magnetic field inside them, rather you could think if it as alternating. As single phase voltage is 180° apart, the motor would simply vibrate when power is applied as it doesn't know which way to turn. In order to "nudge" the motor in the proper direction a capacitor is often used. 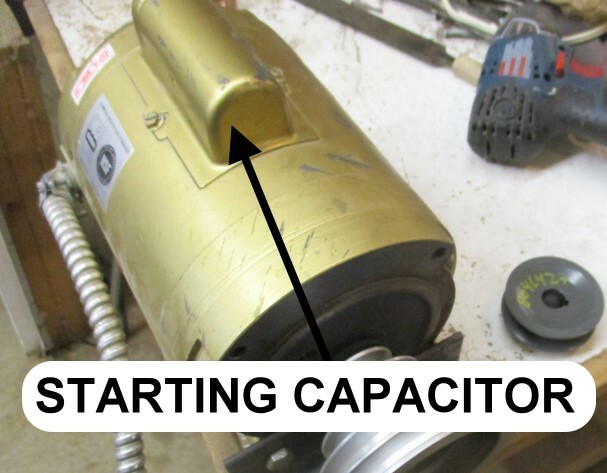 The capacitor "bump" is a tell-tale sign of a single phase motor. The capacitor is used to weaken one or more of the magnetic fields to encourage the motor to begin spinning in a predictable direction. Leaving the capacitor powered while the motor is running makes the motor inefficient, so a switch is used to take the capacitor out of the circuit once the motor gets up to speed. The audible click that can be heard when starting and stopping the motor is a centrifugal switch that is taking the capacitor in or out of the circuit. Depending on the design, some single phase motors you'll see two capacitor bumps. One capacitor is the starting capacitor and the other is the run capacitor. Unlike the start capacitor, the run capacitor remains connected after starting while the motor is running. One of the drawbacks with using a single phase motor on your grinder is that you cannot control the speed of the motor as it is set by the frequency of the supply voltage, say 60 Hz or 50 Hz depending on where you live. Of course changing speed of the belt can be accomplished with different ratios of sheaves (pulleys) but the motor itself is only one speed. One more common exception is a two speed pump motor found in hot tubs. This type of motor will be two pole and four pole with the wires coming to the terminal box to to change the speed. The speeds will be for example 1800 or 3600 RPM. 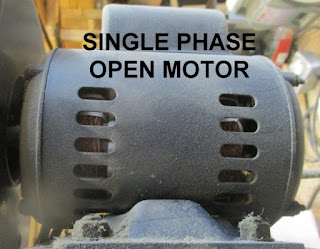 Single phase motors are not always reversible. Motors are said to be rotating forward when the shaft is turning Counter Clockwise (CCW) when viewed from face. That is, looking at the shaft where the wheel will attach. Some designs of single phase motors are not reversible. This is set by how the motor is manufactured. As nothing is impossible, some people pull the rotor out of the motor and re-install in the other way 'round. How's that for reversing and non-reversible motor. There is always a way if you have the time. Many single phase motors can be reversed by changing two wires in the terminal box. Look for a connection diagram on the nameplate or inside the terminal box. This will state something like "to reverse rotation interchange red and black leads". If your motor is non-reversible, it may still be used by re-positioning the motor with respect to the belt. Most everyone will have single phase 120 V in their workshop or garage. Single phase is the power we get at our homes. Common circuits may let us conveniently run a 1 hp induction motor without any issues as long as we 'dedicate' the circuit to running that one motor; that is, not sharing that circuit with lights and other equipment in the shop. Every motor nameplate will show the current in Amperes that are drawn when the motor is fully loaded. Starting a motor requires a lot more current. In some cases as much as five times the nameplate current. Some motors, 1 horsepower at 120 Volts may need a 20 Ampere circuit breaker, even though its nameplate says 14.4 A. Single phase also comes in the form of two 120 V lines. Used together they make double the voltage at 240 V. By doubling the voltage we can use smaller wires and circuit breakers and still get the same work done. Using a motor over 1.5 horsepower means you really do need to have 240 V available. Understanding what you have for supply is a good place to start when looking for a motor that will work for your belt grinder. A single 120 Volt circuit in North America is at minimum capable of supplying 15 Amperes. 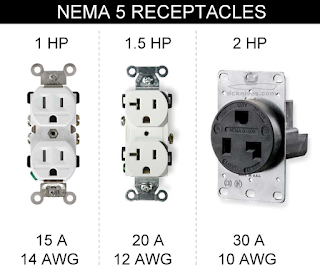 New regulations are making 20 Ampere circuits more common, especially in kitchens. Require a 20 A circuit, preferably dedicated to powering your motor alone. Small VFDs are available with 120 V inputs, normally 1 horsepower or less. 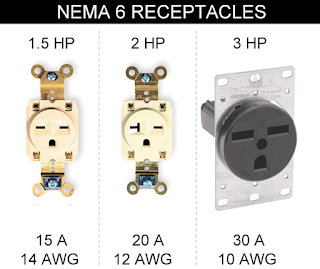 Uses NEMA 5 receptacle and plug. lower current means smaller wiring and circuit breakers to do the same work. 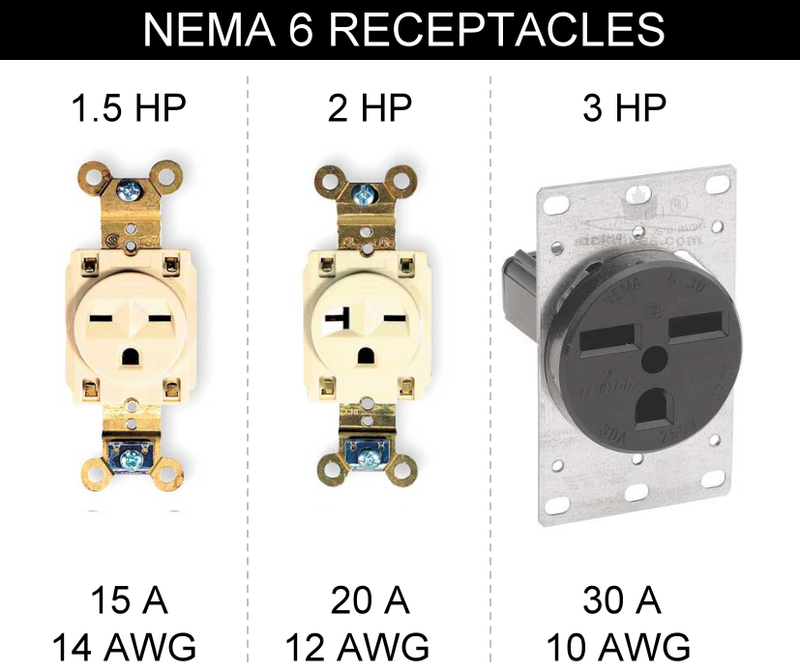 NEMA 6 receptacles and plugs are required. 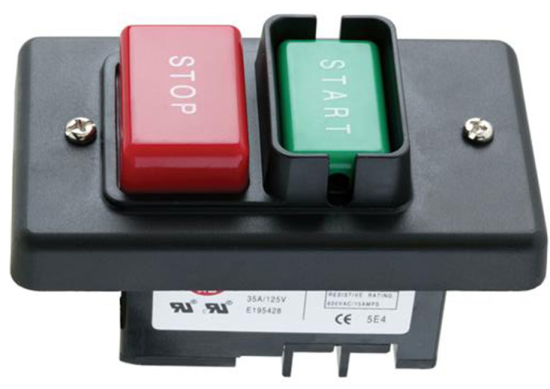 In order to safely turn on and off to your motor you need to use a switch that is capable of handling the voltage and current of the motor. Motors require more robust switches than lights or other simple loads do. When you cut power to a motor, it fights back and produces an arc (spark) that can damage or even weld the switch contacts together. 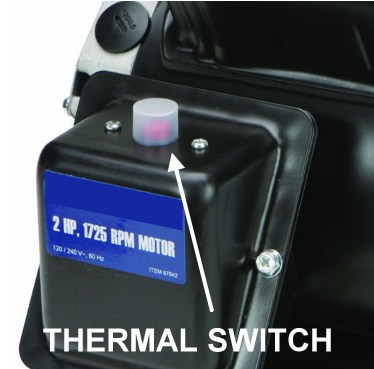 Motor rated switches will have a horsepower rating on them. Something like 3/4 HP at 125/250 VAC. Single pole switches will open/close one contact. This is your basic light switch. These can be used up to 1 horsepower. Double pole switches will open/close two contacts. These are suitable for switching single phase 240 V motors. Three pole switches will open/close three contacts. These are intended for switching three phase motors. However if the switch is mechanical only (e.g. there is no electromagnetic holding circuit inside) you are free to use one or two of the three poles for single phase applications. As motors get larger, a contactor is used to do the heavy switching. A contactor is essentially a relay as it has a coil and contacts that are moved by an electromagnet. Some motors have in-build thermal switches, sometimes called overload switches. These switches open like a circuit breaker when they get too hot. The heat comes from the current flowing through the switch and the motor. When a motor is worked harder, it draws more current and the heat in the thermal switch increases. 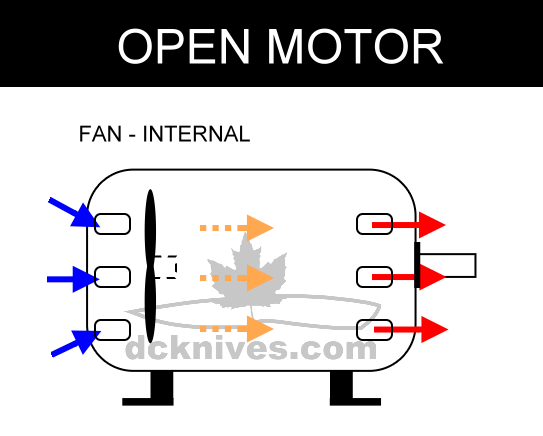 If the motor (and thermal switch) do not get a chance to cool, inevitably the thermal switch will open and stop the motor, protecting it from overheating. For safety reasons, these thermal switches should be manually reset type to avoid a motor started when it's not expected. Although this guide wasn't meant to be a wiring guide, it is important to know what kind of wire is suitable for wiring equipment like belt grinders. The most popular cable for wiring is SJOOW. It is considered portable power cord. It is has a supple rubber jacket that is weather and oil resistant. SJOOW is rated for 300 Volts. The individual wires inside are multi-stranded which helps it be more flexible. You can find it in a wide range of gauges and buy it by the foot at many hardware stores. A similar cable SOOW is rated for 600 Volts and can be used as well. 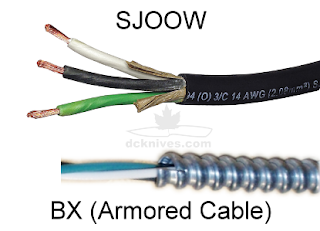 A more permanent cable is armored cable, known in the trade as BX. It's that familiar spiral armor that we've all seen. On the inside is solid copper wires in thermoplastic insulation a lot like regular NMD house wiring wire. Conductor is another name for wire. Cable identified as 3/C means it has 3 Conductors. In North America these are normally one black, one white and one green. Cable identified as 4/C may have red, black, white and green wires inside. Three phase motors, although similar in construction to single phase motors, have windings 120° apart. The motor will always start moving in same direction as the supply determines the rotation. Three phase motors have no need for capacitors. A good thing to note is that any three phase motor can be reversed by swapping any two wires supplying the motor. Many three phase motors can be used for belt grinders. The biggest obstacle with three phase motors is that most of us do not have three phase voltage in our shops, we have single phase. A simple remedy to the lack of three phase is to use a Variable Frequency Drive (VFD). A Variable Frequency Drive or VFD, sometimes called in inverter, Variable Speed Drive (VSD), Adjustable Speed Drive (ASD) etc., is an electronic device that creates three phases to drive a three phase motor. This type of VFD DOES NOT WORK WITH SINGLE PHASE MOTORS! The concept of a VFD as a phase converter works great for home and garage use. We give it single phase and the VFD outputs three phase to run a three phase motor. A VFD must drive a three phase motor. Single phase motors as we know are constructed differently and should not be powered by a VFD. Of course a VFD is not as cheap as a power switch, however the benefits are plenty. Using a VFD means we have the ability to electronically control the speed, direction, acceleration deceleration and many other operational aspects of a three phase motor making it truly flexible power delivery system. For a knifemaker this means slow speed cool polishing and high speed for aggressive stock removal in the same package. For 120 V single phase drives, expect a maximum capacity of 1.5 horsepower. For 240 V single phase, expect a maximum capacity of 5 horsepower, however some models will only go to around 3 hp. This 240 V range of VFDs are very useful as a single phase to three phase converter applications, perfect for a shop built variable speed grinder. Consideration for single phase motors must be given to the required current. It may seem handy to have a 1.5 horsepower motor on a VFD with 120 Volt input right? No need for 240 V! Bear in mind that the input current for this machine may be 24 A. That's a bit more than the average circuit. The high input current is a result of the lower (120) voltage input and the fact that the VFD has to make three phases from single phase. Using a similar horsepower VFD that is rated for 240 V will half the input current to 12 A. This means, smaller wiring and circuit breaker can be used. One example of a 2 hp 1800 RPM motor will offer 5.8 lb-ft of torque. Whereas a 2 hp 3600 RPM motor will offer 2.9 lb-ft of torque. VFDs can manipulate the torque of a motor and can be made to start into very heavy loads or maintain the same torque over a wide range of speeds. Features like "torque boost" and "constant torque" are programmable in most modern VFDs. However, there is as always a trade off. As we increase past the normal running speed of a motor, the torque begins to drop off. Fortunately, this is not usually a problem as your belt is up and whizzing by then. The curve in blue below shows how the torque drops off in a motor when the VFD pushes past the normal operating frequency of the motor. The last consideration is to make sure you are getting suitable belt speed, (Surface Feet per Minute or metres per second) required to do the grinding you want to do. Belts behave differently at different speeds. Many abrasive manufacturers publish recommended belt speeds for grinding materials with their products and some are surprisingly fast. It's not uncommon for a belt manufacturer to suggest 5000 SFM (25 m/sec). It can be a little intimidating when a belt is going by your hand at 55 miles per hour. As a practical range for knifemaking, I'd suggest anywhere from 2500 to 4000 sfm is good. A couple of direct drive examples would get us in that range. 1). A 2 pole (3600 RPM) motor with a 4" drive wheel will produce a surface speed of about 3700 sfm. 2). A 4 pole (1800 RPM) motor with a 6" drive wheel will produce a surface speed of about 2800 sfm. This is why 6 and 8 pole motors are not very useful without some counter-shaft ratio to up the speed. You will need a larger drive wheel to compensate for a slower motor. 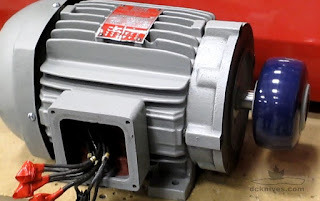 Wheels cost money and larger wheels cost a lot of money, so looking for a two pole motor or a motor VFD package where you can create the speed you need using a smaller wheel makes sense. 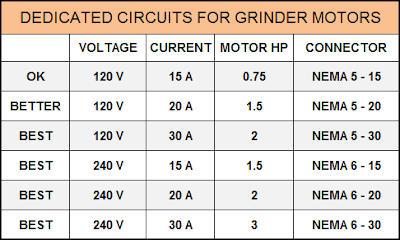 We've looked at a lot of motor parameters so far and it's clear that some motors are better than others for a grinder build. This motor and VFD package is available from Oregon Blade Maker . Good for a grinder build if you only have 120 V supply. Can also be wired for 240 V.
Check out Dealers Industrial for Motors, VFDs and combo packages. Q: Can I change the speed of a motor by changing the voltage? A: No. An induction motor's speed is based on the supply frequency 50 Hertz or 60 Hertz and the number of poles in the motor. Q: Can a single phase motor work with a VFD? A: No. AC industrial VFDs are meant to drive three phase motors. Q: Is it possible to get 230 V from a VFD that is powered with 115 V at its input? A: Yes. Some fractional horsepower VFDs will step up the voltage from 115 V to 230 V. However, these are not usually available over 1.5 horsepower. Q: Will my motor run more efficiently on 240 V? A: No. The power of the motor stays constant the whether wired for and supplied with 120 V or 240 V.
Q: Can I get double the horsepower by hooking up a 115 V motor to 230 V? A: Possibly for a short period of time before the motor burns out. Do not do this. If the motor wiring can be changed for 230 V, then it's okay to. However the horsepower will not be increasing in this case. Q: What size of drive wheel should I use with my motor? A: This depends on the RPMs of your motor. Four pole ~1800 RPM should have a 6" or 7" (or larger) diameter drive wheel, whereas a two pole motor works quite fine with a 4" drive wheel. Q: I have a jack shaft with step pulleys. How can I predict what the belt speed will be at? Q: I have an open motor. What can I do to prevent steel dust from getting inside? A: There is not a lot you can do. Air will always be sucked through the motor to cool it. You can make a shroud or hood as long as the motor has air moving through it so it doesn't overheat. You can also blow the motor out with compressed air periodically. Q: My motor bogs down really easily and sometimes won't start. A: Check that you have the correct voltage setting on the motor itself. A motor wire for 230 V that has 115 V applied it may rotate, but it will perform poorly. Q: Can I use a regular light switch to turn a single phase motor on and off? A: Yes, up to about 1 horsepower. It is always recommended to use a switch with an appropriate horsepower rating marked on it. Q: I have a single phase motor that doesn't have a horsepower rating. How do you figure it out? A: Multiply the voltage and the current, then multiply by 0.85, then divide by 746. This will closely approximate the horsepower. Example: 115 V x 9.5 A x 0.85 = 928. 928 / 746 = 1.24 hp. Q: Can a washing machine motor work for a belt grinder? A: No. It is an open motor and is generally too low horsepower to be useful in a belt grinder application. Q: I have a motor from a hot tub. Can this be used for a decent belt grinder? A: Yes, but the shaft on the motor will likely have no keyway and will have a threaded end for the pump impeller. It will take some fiddling, but it can be used. Q: Should I buy an inverter rated motor? A: It certainly would be better, but not necessary for short cable runs. Q: My motor is 115/230 Volts, but I don't have 230 V in my garage. Can I get the most of the motor at 115 V? A: Yes. The motor will produce the same power at 115 V. However it will be drawing twice the current. Make sure your wiring, switch and breaker are capable. Q: The motor I have says "non-reversible" on the nameplate. Can I still use it? A: Yes. You will likely have to physically re-position the motor to work around its fixed rotation. Q: I have a single phase motor that just sits and hums. What is wrong with it? Q: Is it true that running a motor slow can cause it to over heat? A: Yes this is possible. However motor manufacturers often use the same fan for 2 pole (3600 RPM) and 4 pole (1800 RPM) in a given line of motors. Running a 2 pole slower less harmful than running a 4 pole slower. Running a 2 pole at 1/2 speed is the same as running a 4 pole at full speed. I hope that you have discovered a few things about AC induction motors and how they relate to a DIY grinder build. Please join the conversation below and ask a question if you have one. Thanks for stopping by. If you have any questions or suggestions, please let me know. All the best with your grinder build. You put a ton of time into this post, not that you were slacking on any of your other post. But this a whole bunch of useful information. Excellent job man, thanks for all the effort you put into this. Echoing everyone else, thank you for posting a lot of this information. I've been referencing your site for a while as I'm building a 2X72, and it's been invaluable. Thanks for your kind words. If you have any questions, just give a shout. I am new to knife making. Therefore, I have searched YouTube.com for advise only to find a bunch of BS. Thank you for providing trust worthy and reliable information that I find necessary to get started. Everything posted is excellent, and very much appreciated by all of us who are finding time to start our own builds! I am looking at mounting my motor mid frame and welding hinges to flip the entire rack above the tool rest, hinges on the tool rest to upper main 2 x 2, so it is vertical or horizontal. Will be using stacked pulleys to vary speeds. Good luck with your build. If you can send some photos that would be great. Hey Dan, great work, thank you. I'm having problems with my motor. I have a 2hp motor hooked up to 240v 20amp power supply and yet the motor doesn't do anything when I plug it in. No noise no hmmming, nothing. Does anyone know why? Sounds like the motor connection is open or the wiring to the winding has opened up. If it was humming, it's suggest the capacitor or centrifugal switch, but no sound at all is usually an open circuit. Check the terminals, wires and any wire nut connections. If you have an ohmmeter, power off the motor and measure the resistance between the hot and neutral. It should real low ohms, less then 30 ohms. If it reads open (millions of ohms) then there is an open somewhere. All you can do is visually inspect unless you want to take the motor apart and check the windings. That is a reliable setup. The VFD is pretty much the standard for adding to OEM belt grinders. I would highly recommend having the KBAC-24d wired into 230 volts to get that extra horsepower. I have a very similar motor on my Sayber and I love it. I have a hallmark ma0515f.If I buy a VFD,I will have the ultimate choice. I have no clue on which VFD to buy. I have 110V can I use this motor? I would like to set it up as choice 3 for now. It has a lot of wires where can I find which two to wire into my switch? 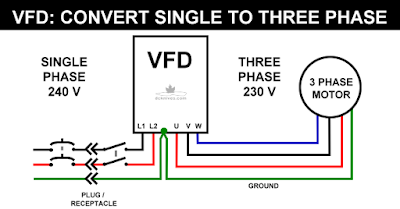 Your motor is meant for three phase power and will not work on single phase (household) unless you have a VFD or something like a phase converter. The VFD is the obvious choice as it gives you speed control, forward/reverse control etc. Being 1.5 hp, you run it with a VFD at 115 V. A few offers exist. The easiest to implement is the very popular KB Electronics KBAC-27D. This drive is sealed and pretty much wire and go. Another option is the Marathon T205. However, this VFD will require an enclosure to keep the damaging steel dust out of the electronics. Dan. This is awesome stuff. I think I need your help. I have a 2x72 coming in the mail. It's a chassis with wheels package. 4" drive wheel. I bought a motor on the maker's recommendation. Princess auto 1.5 hp 1800rpm tag. The switch I bought on the recommendation of the guy at the store is garbage. When wired to just a plug it runs fine. Wire it to the switch and it trips the breaker. Also, it's an 1800 rpm unit, so I need it to drive the belt faster, right? I don't have 240v available, so I'm wondering what your recommendations would be in regards to a proper switch, and how to make the belt go faster. USE SMALL WORDS, please, lol. I recommend at least 20 amps dedicated circuit for a 1.5 hp. The starting current is a lot! A proper switch is a real motor switch that has a horsepower rating on the switch itself. The switch shown in the photos above will handle your motor. As for tripping the breaker, you likely have it on a 15 amp circuit. To make the belt go faster simply use a larger wheel. That's easiest way. You could go with a pulley, belt, bearings and shaft but and get a few speeds, but this option will depend on the design of your grinder. Some grinders require the motor to be face mounted and the jack shaft is not possible. For an 1800 RPM motor I recommend a 7" drive wheel. This will get your belt speed closer to the abrasive manufacturer's specified speed. Most belts do a good job around 4000 to 5000 feet per second. I have a tool for figuring out your belt speed here. You can run it with a 4" wheel, but it will be severely under speed. Hope this helps. If you need more help, drop me an email at knives @ dcknives . com. DC you are awesome to provide all this information. I have a question on the drive wheel size. I have acquired a 2HP, 1710 RPM, 230/460V 3 PH motor. 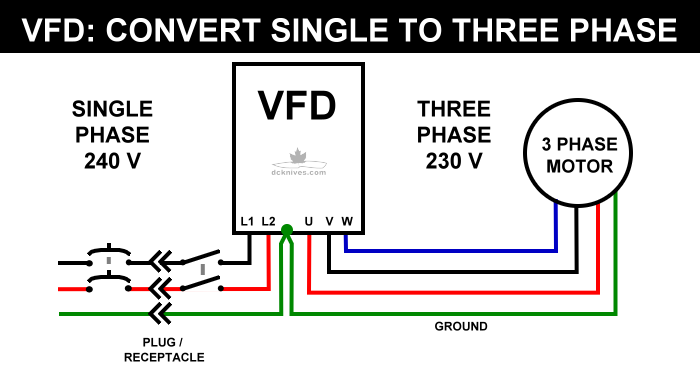 I plan to order a 240 V VFD to convert from single to 3 phase. However, with the 1710 RPM should I go with a 6”, 8” or what size wheel? I apologize if I missed something. I read it twice! What was your total cost for this build? James, With a VFD you can speed the motor faster if you like. It can quite easily go to 2 times the rated speed. I would work a 4" wheel on it and use it direct drive. If the motor was fixed speed (single phase) I'd go for a larger drive wheel. Hi A G, what build are you referring to? I'm working on a countershaft design and currently selecting pulley sizes. Just wondering what the most common belt speeds are you run. I imagine some operations require higher speeds and some lower. I expect I'll have a 3 speed pulley setup. Good information on the motors, only thing that came to mind was that you had very little information on motor protection. Your three phase examples aren't really an issue because almost all VFDs are designed with thermal overload protection curves built in, but not all single phase motors have internal thermal overload protection. Just having a switch / relay / breaker thats rated for the motor current won't necessarily provide motor overload protection. Just something to keep in mind for people scavenging single phase motors. I operate at a few different speeds. Mostly around 4000 SFM as this produces a really good finish with most belts. I also run about 2000 SFM when using the small wheel attachment to prolong the bearing life. If I had three speeds I would go with 1500, 2500 and 4000. There is a belt speed/SFM calculator here if you want to run some different ratios. Yes, lots of motors do not have in-built thermal protection. This is why sizing your breaker is important to provide at least some overcurrent protection. Thanks for taking the time and effort that you do to create and manage this great content. What impact does running a larger drive wheel have on the motor and set up beyond the additional cost. So for instance, if you are running a 1.5-2 HP 3600 RPM motor with VFD, the 6" will give you a much higher belt speed. But with the VFD, you can always bring it down with the variable speed. But I wonder if that's smart as it may cause stalling faster, especially with a 1.5HP motor. Is 4" really the sweet spot, or if you had a few more bucks, would it be better spent on a bigger motor or elsewhere? I know some who run a 5" wheel on 3600 RPM motor and VFD, which gives more belt speed per RPM, but having a VFD it doesn't make a lot of sense to buy a larger more expensive wheel when the VFD can achieve the same thing. On a four pole motor, the larger drive wheel makes a lot more sense. Consider a four pole motor and a KBAC VFD. KBAC's can go to double the frequency or 120 Hz maximum. The motor in this setup would be able to run at close to 3600 RPM. A 4" drive wheel would give you belt speeds around 3650 SFM. That's pretty good, but that's the upper limit. Many abrasive manufacturers recommend 4000 to 5000 SFM. Going to a 5" wheel with this setup would get the top SFMs around 4570, which produces the finish we want with quality abrasives. The same VFD with a two pole motor can go to near 7000 RPM to start with, and a less expensive 4" wheel covers the whole range well, with a top SFM of near 7000. That's faster than required for steel and brass on so on. With a these micro VFDs, there is a practical limit of about 2 hp for single phase 230 V supplies. Sure there are VFDs out there that are larger, but it seems that 3 hp and up start asking for three phase voltage going in which most of us don't have at home. I would go with the 4" drive wheel on a two pole 2 hp motor and a VFD. It's a great combination and is a cost effective means to an end. If I had some more cash left over I would buy the large contact wheel. Hi, thanks for this very comprehensive beginner friendly motor guide. I have a few questions regarding treadmill motors. I could acquire cheap working treadmills near me but are they suitable for this project. I do have a 1HP 230 1PH motor but I was going to make 4-5-6 inches driving wheels and it seems tedious compared to finding a 3PH+VFD motor. If I am correct, there is a VFD embedded in the treadmills controls but are these motors suitable motors. The 1 hp single phase motor would be a good candidate for a belt grinder. Preferably it is sealed (TEFC) and has a suitable shaft 5/8" or 7/8" diameter for mounting a wheel. If the motor is a 4 pole (1800 RPM) then go with the 6" wheel and if it's a 2 pole (3600 RPM) go with the 4" wheel. The main difference one will notice between a DC treadmill motor and an AC induction motor is the recovery after loading. The DC motor controller (in most cases) doesn't know how fast the motor is turning so when it gets worked hard it recovers poorly. On the other hand, the AC induction motor is constantly trying to catch up with the powerline frequency (60 Hz) and when loaded it fights harder to stay at speed. This is very noticeable when grinding. As for going with a VFD and three phase motor, this gives us the best of both worlds, a strong recovering motor and variable speed. But this comes at a cost. Normally I don't run my grinders slow unless I am using the small wheels where the speed on their bearings is factor. Lastly, the ability to mount a decent drive wheel needs to be looked at. Treadmill motors use non-standard shafts and do not have keyways in them. Whereas the large majority of AC motors have keyed shafts of diameters where attaching a pulley or drive wheel is a piece of cake. Anywhere in particular I could salvage a 3 phase motor? I bought two three phase motors on Kijiji in the past, 2 hp and 3 hp. Each was under $40. Usually it's from people that buy industrial equipment and they have to change out to single phase motors to make it work in their garages/shops. Keep an eye out and ask around. Anything more than $200 is too much. We can buy a new 2 hp motor, shipped from the USA for around $200 Canadian. Dan, Thanks so much for this blog. You have no ideal how helpful it is to new makers such as myself. I have a quick question on motors. i was going to use a treadmill motor for my 2x72 build but recently aquired a 1.5 hp 230/460 3ph Baldor model EM3554T. It is 4 pole 1760 RPM 4.14/2.07 amp. Will this be sufficient with a VFD and do you have any suggestions for savings on a VFD. Thanks again. That motor is a great candidate for a VFD. The savings in VFDs comes from the enclosure. Open chassis VFDs are significantly cheaper than sealed units like the KBAC-27D. These open chassis units also required some protection from harmful dusts in the grinding environment. Option 2: Spend about the same amount and get a KBAC-27D, wire it up and go. The going rate for a sealed VFD in this horsepower is $360. KBAC-27D with free shipping. The KBAC-27D has the benefit of being able to run with a 115 V supply or a 230 V supply. Whatever option, the 4 pole motor slower, so you'll be using the VFD to speed it up past its normal operating speed. Going to twice the speed is generally not a problem, especially with a well built motor like your Baldor. I got my hands on a 208v 3PH 2.4HP TEFC motor. So my guess is I might need something like KBAC-29 (1P) as my VFD. Do you have a good canadian supplier so I don't get ripped off (they are quite expensive)? The 29(1P) is the right VFD to get in the KBAC series. I bought my KBAC-27D (the 2 hp version) from a vendor on Amazon.com. It was around $500 CAD with duty, exchange and GST. Everything was charged by the vendor via Amazon and there was no surprise COD charges. Shipping took about 4 business days which is pretty good coming from California. I did some research before buying and the two Canadian distributors I contacted were $575 to $615 CAD and I would still have to pay freight from their warehouses in Canada to my place, not to mention 2 week lead time. I suspect they are doing what I did and marking it up for their time. Thank you Dan for your help. Can I make a bench grinder with it? Normally I wouldn't recommend a 5 hp is a lot of motor and requires a high current circuit to run it. Do you know the frame size of the motor? This will tell us what size the motor shaft diameter is. Hopefully We can make it work, but it's all I have. I know 5hp. Is big What do you think? Great. The 56HZ has a 7/8" motor shaft diameter so you can readily get a wheel that fits it. Now it's only a matter of getting the AC power to the unit. Good luck! I think you'll be very happy with that combo. Being a 2 hp motor your best bet is to have a 230 V receptacle installed. The 27D is rated for 1.5 hp at 115 V supply or 2 hp at 230 V supply. I put the main power switch in my KBAC. There's a link to it here. The parts are from hardware/automotive store and pretty easy to follow instructions. Similarly, I added the FWD/REV switch too on a page here. Good luck and happy grinding! Hi Dan, can I use as motor angle grinder DWE4257 DeWalt 1500 W varialble RPM 2800-10000 / min ,. If yes, what wheel diameter do you recommend. I can't say whether or not the motor will have enough torque to get a belt and all the wheels rolling. I have seen a YouTube video where a fellow used a Makita angle grinder and about a 2" (50 mm) diameter wheel and it seemed to work ok. Plenty of belt speed. Hi Dan, Frist thank you so much for taking the time to do this. I know how much time things like this can take. I just bought a baldor JMM3555T, 2hp, 3 phase, 230v, TEFC motor off ebay for super cheap. I'm a little worried that since I got it so cheap it might not be a good motor for my new 2x72. I had a 1hp but it wasn't cutting it so I'm upgrading. Based off of what you wrote this new motor should be an amazing choice. Am I correct or am I missing something about this motor? Thanks again for this guide. How do you know how many pole the motor is ? One can determine the number of poles by the nameplate RPMs. If the motor is near 3600 RPM it will be two poles, if it's close to 1800 RPM it will be 4 poles, if it's near 1200 RPM it is six poles. These numbers are approximate for 60 Hz motors. The numbers for 50 Hz are 3000/1500/1000 RPM for 2, 4 and 6 poles respectively. The only issue I see with the JMM3555T is the J shaft is a pain for use in a belt grinder. It is meant for attaching an impeller and used primarily for pumping applications. There are work-arounds for this however as the common bore drive wheel is 7/8" it would mean machining the shaft's shoulder down to 0.875" and re-machining the keyway. The specs for the motor are here. Hello again Dan, thank you for the feed back on the JMM3555T. I decide not to mess with the motor and now instead going to buy a new one. I sold some old tools and now have to funds to buy a good new motor. I was looking at the CEM3559 Baldor motor. Based on what I read about it, this motor should be an excellent choice. Am I correct? Just wanted to check with you before I buy another wrong motor. Thanks again for helping us new guys out with this. The CEM3559 is a better choice. I would like to point out that the motor is is 3 hp. There are 3 hp 230 V single phase VFDs available they are quite rare. One choice is the KBDA-29 (1P). If you had this in mind I can see it being a great combination. Thanks Dan again for your help. I did have a 2x72 by Pheer grinders but it was only a 110v 1HP. I bought it at the time because I didn't have access to a 220v outlet. Now I do and the 1hp really isn't doing it for me. So I sold it and with the money I got from it I bought the stuff to make me a tilting grinder. I went to the 2hp and after I read what you wrote about it I thought I would just get a new one. Then I thought why not just get a 3hp motor? So I did some looking and I found a good but used KBAC-29 on craigslist. Had to convince the person to ship it to me and they did. Now I just need my motor. Any advice on good places to buy the cords for the VDF and motor? 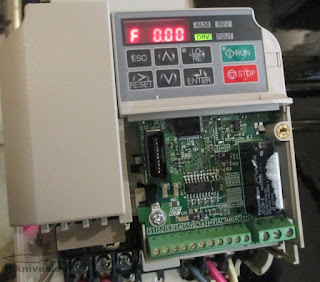 Yes, the KBAC-29 (p/n 9528) is a 2/3 hp VFD, however if you read the specs closely, it is only rated at 3 hp when connected to three phase supply. :-( If you have single phase supply (like most of us) we'd wire it up and use the 2 hp rating. (see table 2 on page 7 in the manual). I bought my cords, strain reliefs and plug from my local Home Depot. They sell "cab tire" or SJOOW cord by the foot/metre in the electrical department. Be sure to get 4 wire for the run from the VFD to the motor and 3 wire from the plug to the VFD. I have a leeson HP 5 with 3450 RPM phase 1. Is that too much motor? It's more a matter of the frame size and your power supply. If the frame size is a 143T, 145T or 56 you can easily get a drive wheel that fits. It's not so easy to find a drive wheel to fit larger motor shafts. If your motor is a frame size 182T or 184T you can use pulley/belt/counter shaft. If you've got the smaller frame size, then it's on to the power question. If you can provide the nameplate voltage and amperes then you can use it. A 5 horsepower will pull a lot of current to start. Without knowing the nameplate data it's hard say what the exact requirements are, but I would venture a guess that you'll need 230 V on a dedicated 30 A circuit. Small diameter wheels can be a problem with fixed speed motors. If your small wheel is 1/8th the diameter of your drive wheel, then the little wheel is going eight times the RPM of the motor. Even with a slower four pole motor (UK 50 Hz) you are looking at near 12000 RPM no load with the little guy. Depending on the grinder design, you can use a counter shaft and stepped sheave or two coupled with a belt. This decreases the horsepower reaching the abrasive belt, but will give you some low cost speed selection to work with. You can run the little wheels slower and they will last much longer. 1.5 to 2 hp you won't miss the loss in horsepower too much. Motor selection may be influenced by how you intend to use the grinder. If I was working with a lot of tubing and notching small diameters, I would opt for the slower motor and save the small wheel bearings. I find in knifemaking I don't use the small wheels nearly as much as the flat platen or large contact wheel. I would take the faster motor over the slower motor for improved abrasive performance at the higher SFM. Another option is to have two sizes of drive wheels and do a swap when you want to run the belt slower. Came across an opportunity to pick up a JM11-007 out of a treadmill, would this be a good motor for a belt grinder? 3HP, 60 HERTZ, 3 phase, 230 volt, 6.5 amp. What would you recommend for a VFD? The only issue I have with the JM11-007 is that the motor is an open frame type and susceptible to dust contamination. Dust from a belt grinder is nasty. Even when running a shop-vac when grinding, I find metallic dust gets everywhere. It's impossible to say how long the motor will last, but certainly an open motor will die sooner than a sealed TEFC type motor. Open frame aside, if you'd like a VFD that is off-the-shelf packaged for dusty environments then take a look at the KBAC-27D (P/N 9520). It's pretty easy to wire up and is fully enclosed so dust and water stay out of the electronics. This VFD is rated for 6.7A at 230 V so it will fit the bill. If you are a little more adventurous and don't mind a some wiring and effort, you can save some dough. I have a HuanYang 2.2 kW 220 V VFD that works perfectly well on my Sayber OSG. I wired it inside an enclosure to keep the dust out and added some switches for start/stop and a potentiometer for speed control. It's been in service for almost two years without issue. Belt drive usually refers to the application. Belt drive motors are used in HVAC where pulley/belt/fan setup is used for a blower or ventilator. These motors are usually open frame (ODP) types which need to be protected from the elements. 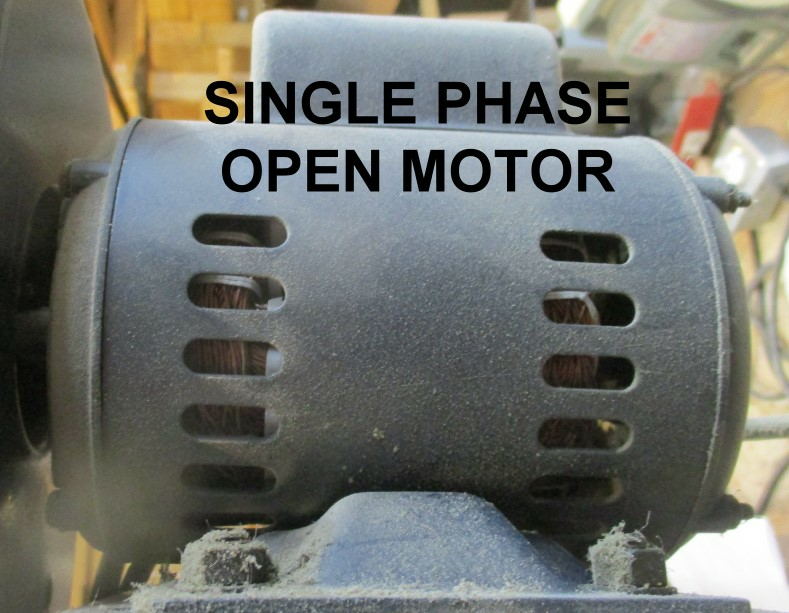 A sealed motor is preferred for a grinder, but if the price is right an open motor can be used until it gives up the ghost.